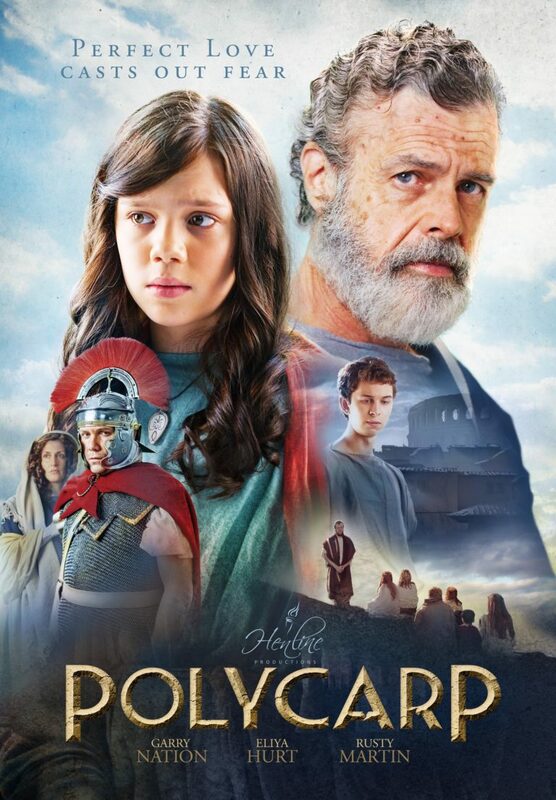 POLYCARP is a touching drama about Polycarp, the aged Christian Bishop of Smyrna in the Second Century, who befriends a young slave girl and brings her to faith during a time of growing conflict with the Roman Empire. POLYCARP is a gripping, compelling, inspiring presentation of the power of the Gospel to transform lives. It’s a powerful, family-friendly illustration that perfect love drives out fear. This inspiring film is based on the true story, and historical accounts, of the lives of Polycarp, Germanicus and Irenaeus. It’s seen through the eyes of Anna, a young slave girl who is redeemed by a community of Christians, in second century Smyrna. The movie begins with gladiatorial sports in the arena. Christians are being dragged out of dungeons and led into the arena. As a young girl is left distraught in the dungeon as her mother is wrenched away from her by Roman soldiers, a woman seeks to comfort her by relating what happened eight years earlier in a slave market of Smyrna. Polycarp responds to warnings that they intend to kill him. “If that is true,” he says. “I shall receive a great honor: to share in the sufferings of Christ.” Anna is horrified and confused by Polycarp’s attitude. Polycarp is a gripping, compelling and stirring presentation of the power of the Gospel to transform lives. It is a powerful illustration that perfect love drives out fear. Inspiring and triumphant, with a magnificent musical score, it is a family-friendly movie that can be screened to any church, Sunday school, youth group, or camp, without any reservations. Polycarp is one of the great early leaders of the Christian church. He has a direct historical connection to the Apostle John, which helps certify the historical reliability of the Christian faith and the New Testament writings. (CCC, BBB, Pa, V) Very strong Christian, biblical, moral worldview with clear, powerful presentations of the Gospel, compelling conversations, inspiring examples of self-sacrifice, heart-rending situations and boldness in the face of peer pressure, family pressure and state persecution; no foul language; some restrained violence including violence in the arena and burning of Polycarp at the stake; and, nothing else objectionable. POLYCARP is a gripping drama about Polycarp, the aged Christian Bishop of Smyrna in the Second Century, who befriends a young slave girl and brings her to faith during a time of conflict with the Roman Empire. Christians in Smyrna rescue and adopt Anna, a young slave girl. Polycarp befriends Anna and starts teaching her about the Gospel of Jesus Christ. However, Anna struggles to reconcile her beliefs with those of the Christians. When the Roman Proconsul demands all citizens worship Caesar to show their allegiance to Rome, Polycarp and the Christians in Smyrna must find courage to stand for their faith against persecution. Anna is forced to come to grips with the Truth and choose whom she is willing to live for, and die for. Polycarp is a gripping, compelling and stirring presentation of the power of the Gospel to transform lives. It is a powerful illustration that perfect love drives out fear. Inspiring and triumphant, with a magnificent musical score, it’s a family-friendly movie that can be screened to any church, Sunday school, youth group, or camp, without any reservations.